The world of Nightcrawler is a strange and terrifying one, but one in which you cannot help but want to dwell. For one thing, it is repulsively beautiful, all neon and sulphuric street lights, blasted planes of blacktop and palm trees. Then of course there is our guide through this nocturnal hellscape, Lou Bloom. Gaunt, gazing, and possessed of a fiery passion for his own self-interest, Jake Gyllenhaal inhabits a skeletal monster with the kind of vigor and power that would make him a compelling hero were his intentions and actions not so repellent. The story tightens like a noose, but one which you know Bloom will slip out of while still finding another neck for the karmic hangman to dangle. It’s powerful, crazy stuff, and surprisingly fun. – Brian R.
In Stray Dogs, three actresses play the same character, with the first of them departing after the film’s first shot and the third taking over after the film’s central ellipse. The Buñuelian tactic gives the film a narrative ambiguity that could easily feel cheap and pointless, but Tsai makes it work. Perhaps it’s because Stray Dogs qualifies unambiguously as “Slow Cinema,” with shots of eating or looking at murals taking up several minutes, making it easy for the impatient and skeptical to say that “nothing happens.” But Tsai’s style forces us to question conventions, and among those conventions is the way in which we make sense of narrative. The ambiguity is therefore not just earned, but crucial. Tsai is equally subtle and clever in a series of four non-consecutive shots in which the protagonist (Lee Kang-sheng) serves as a human billboard, where the personal and political are gradually privileged, his aesthetic decisions being central to everything the film has to say. Never is this more clear or well-done than in the stunning penultimate shot, the film’s longest, in which humans — or at least the better of us — are implicitly differentiated from stray dogs because of our ability to find solace and make sense of art. Or, at least, that’s one interpretation of it. 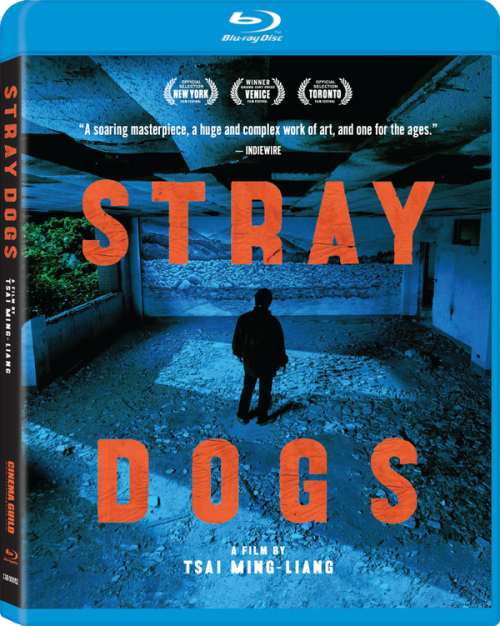 Thanks to that narrative ambiguity, Stray Dogs is not just perfectly executed — it’s also a gift that keeps on giving. – Forrest C.